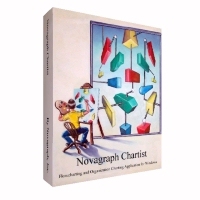 Chartist Flowchart Software, By Novagraph - Buy Chartist Now! When you purchase Chartist online, we offer you a no-risk 30 day money-back guarantee. If, within 30 days of your purchase, you decide that Chartist is not for you, simply contact us by email, with your order information, and we will refund your original purchase price. Quantity discounts apply, see below. If you are a registered user of Chartist-Std or Chartist-Pro, you may order an upgrade. If you currently have Chartist-Std and wish to move up to Chartist-Pro, you may do so, by ordering the Chartist-Pro upgrade. If you have multiple licenses, see the information below for pricing. The online order form automatically factors in any quantity discount. See below for quantity discounts on upgrades. No matter how you purchase, be sure to "white list" our site, novagraph.com, on your email server. Otherwise you may not get your license information. There are quantity discounts for Chartist and Chartist-Pro. The online order form automatically applies any applicable discounts to the items you order. We designate any order of more than 1 license as a LAN license. When we do that, we assign you a single product key for installation. This key can either be installed on a server with the application on a shared path, or it can be installed and distributed to the licensed number of systems.